A mezzotint after a painting of three three-quarter length figures gathered before an easel: Agostino Carlini stands on the left; Francesco Bartolozzi is sitting between him and Giovanni Battista Cipriani, who sits with brush in hand before a canvas. Inscribed below: Painted by Giovanni Francesco Rigaud. / Engraved by J.R. Smith. / Agostino Carlini. fransescho bartolozzi. Giovan Battista Cipriani / London, Publish’d March 5:th 1778, by W: Humphrey, N:o 70, S:t Martin’s Lane, & J:R: Smith, N:o 10, Bateman’s Buildings, Soho Square. The sheet has been cut within the platemark below. 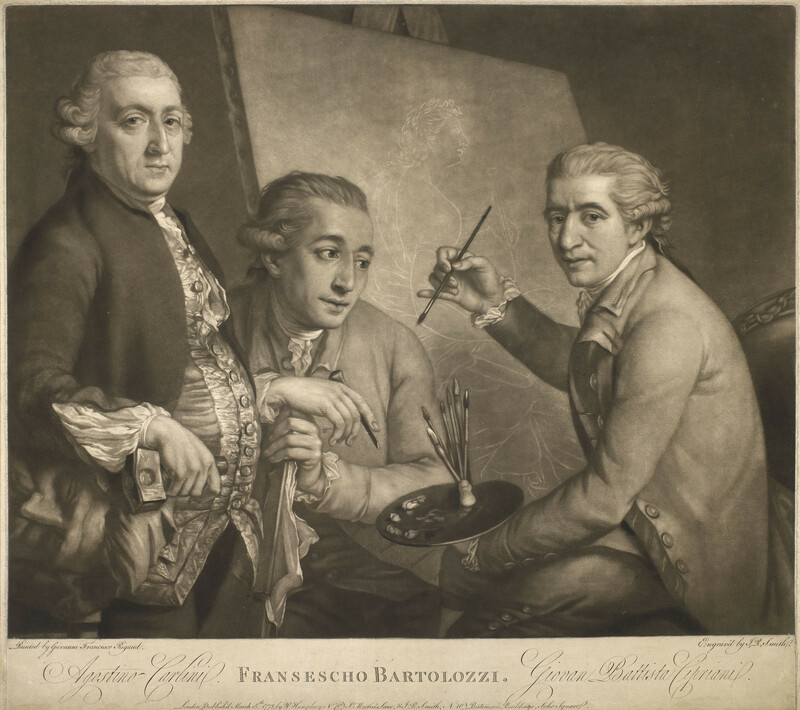 The print reproduces a painting by Jean-François Rigaud (National Portrait Gallery, London) portraying the three Italian artists who had been among the founder members of the Royal Academy in 1768 – the sculptor Agostino Carlini, the engraver Francesco Bartolozzi and the painter Giovanni Battista Cipriani (see also RCIN 913294, 913295). The painting was exhibited at the Royal Academy of Arts in 1777 – entitled simply Portraits of Three Artists – but it remained in the artist’s possession, and he was no doubt responsible for having Smith make a mezzotint after it. Carlini (c.1718–90), who had arrived in England by 1760 and was Keeper of the Royal Academy at the date of the painting, is shown holding his mallet and leaning on a colossal head on its side, an allusion to the keystones of the rivers Dee, Tyne and Severn that he was then carving for the external decoration of Somerset House. Bartolozzi, seated at centre, is holding his engraver’s burin; and Cipriani is about to begin painting a canvas on which is outlined a figure of Fame with laurel wreath, book and trumpet (cf. RCIN 830465, 906180). Five years later Rigaud painted a similar group portrait of Sir William Chambers, Joseph Wilton and Sir Joshua Reynolds (also National Portrait Gallery), which his son claimed to have been ‘intended as a companion’. It is perhaps too easy to read into such portraits what one already knows: there was a longstanding antagonism between Chambers and Reynolds (see RCIN 641007, 640290) and in the latter painting the sitters can be seen as somewhat aloof from one another; here the three compatriots occupy each other’s space with an easy familiarity.